The day began as any other.....NOT! There were 10 families in all and 3 of us were returning for our second daughters. Let me tell you the second time around is every bit as nerve racking as the first! We all gathered for breakfast in the hotel's western restaurant. They had a lovely buffet with many western style menu items, as well as, many Chinese items. My personal favorite was in the chaffing dish with the English sign identifying it as "Hash Browns" When you took off the lid what you found was this white mass of stuff. Now I'm an ex-hospital food service director and we've been know to serve some pretty funky things (yes I do have a cook book called 1001 ways to serve green jello!) But this was really interesting, I knew it had to be potatoes of some sort so I tried it and it was exactly what I thought it was..... instant mashed potatoes....no butter, no salt, no pepper, no milk.....hmmmm this looked kind of familiar, it made me reminisce about the old days. Anyway back to the story, Mr Gu and Raymond came around and told us to be in the lobby at 9:00 and bring our gifts for the orphanage nannies and paperwork. Linde and I went upstairs and gathered up the diaperbag aka backpack with a change of clothes, wipes and diapers. 21 very excited and nervous adults were driven to a civil building. We were given a package of milk powder/formula before we got off the bus. "Oh that's nice" I thought, "I didn't bring a bottle. Oh well we won't be here long, it didn't take long with Julie" (Editorial note: Even with the same adoption agency, adoption trips ARE NOT the same, I think it's done so that adoptive parents have the same experience as biological parents who will tell you that no two pregnancies are the same.) We we herded up to the 3rd floor (no elevator, but we were allowed to climb slowly) and taken to a room with a large conference table. Mr. Gu and Raymond were giving us directions on filling out the paperwork when who should appear.................... The Babies! The nanny's just came filing into the room each carrying 2 to 3 babies. We just glanced at them and kept on filling out our paper work and paying attention to Mr. Gu. Yeah Right! Needless to say pandemonium broke out. We all knew exactly which babies were ours. We all kept getting up and going over and cooing at our daughters. Mr Gu and Raymond kept trying to get us back in our seats to complete the paperwork. Finally they gave up and let us at the babies. Linde had been over playing with Rose and the rest of the babies. I've always said my sister is a "baby magnet" children just flock to her, she's like the Pied Piper. She got the first smile out of Rose (who was very fussy and crying when she was brought in the conference room). After we'd settled down somewhat, at least one parent from each family had to return to their seats and complete that darn paperwork. We were formally presented with our daughter and pictures were taken as each child was turned over to their new family. Rose who was already upset really went ballistic when she was given to me. The nanny took her back and then tried again to give her back. I was kind of getting perturbed with the nanny as I was prepared to deal with a crying baby, I knew she was scared (shoot I was too) but we needed to get to know each other. The nanny was trying to take her back again when the head nanny said something to her in Chinese, which I think was in effect.....let the new mama have her. The nanny didn't try to take her back again and in a few minutes Rose settled down. One of the group members chose this time to change her babies clothes. You could see the hair standing up on the nannies necks, the clothing police were out! This new mom didn't put enough layers on her daughter, so finally the mom put some of the old clothes back on underneath the new outfit, thus appeasing the nannies. I just left Rose in what she was wearing, only changing her diaper (I kept the 3 she had on as a memento) We were all then herded back down the stairs out of the building and down the hill (Kunming is in the mountains, it's Denver, CO's sister city) to a photography studio to have our pictures made with our new daughters for some official reason (this wasn't done with Julie). While were at the photographers it began to rain quite hard, it had been drizzling but now it was a full fledged cloud burst and here we were with our new babies and the bus was up the hill. A couple of the men in the group went out and bought us all umbrellas. We trudged back up the hill slowly, as Kunming's altitude is over 5000 feet. More paperwork was completed and we went back down the 3 flights of stairs to the bus. Several of the families had brought bottles and thermo's full of hot water. I didn't bring a thermos with me to China because I hadn't needed it with Julie...big mistake! Poor Rose was starving by the time we got back to the hotel. The first thing I did when we got back was make that baby a bottle. She inhaled it. Then she got a bath. She loved this, she didn't even mind having her hair washed. After the bath we put her down for a nap and my little Rose crashed. We were told to be back down in the lobby that afternoon as we had to go to the notaries office. It had stopped raining and the sun was shining and it was hot. We all got on the air conditioned bus and took off. When we got there they decided to let us all stay on the bus and just Mr. Gu would go up. The notary's office was on the 5th floor and there was no elevator. Well Mr. Bus Driver wanted to save energy and he turned off the bus, so now there were 21 adults and 10 babies sweating their ($&%'s off. Just about this time Rose decided to initiate mom. I got to deal with my first full fledged blow out diaper. Keep in mind I was not a new mom, this was my second daughter, BUT, I'd never had a blow out diaper. Oh my gosh, thank heavens my sister was with me. She held Rose up and I changed the nasty diaper. I'd brought diapers and wipes but did I have an extra outfit....nooooooooo. Robin to the rescue. On of the mom's (and a new one at that) had an extra sleeper. We put this on Rose, only I didn't button it up all the was because my little daughter was HOT, she was sweating like crazy. About this time a couple of the orphanage workers boarded the bus and here I was sitting with my new daughter half undressed! They nearly had a cow, well so did I, I let them know it was too hot (and I had help from the other parents) and they made Mr. Bus Driver turn the bus back on. After we got back to the hotel it was time for another bottle, Rose again inhaled it, then proceeded to have projectile vomiting and again initiated me. This was something else I'd never delt with, I'd never been thrown up on. This pretty much set the tone for the rest of the trip. My daughter (and several of the others) was sick. About half the time she would throw up everything we gave her and this was mixed with chronic diarrhea throughout the day. I tried changing formulas which only worsened the problem so I put her back on the original orphanage formula. One of the families had the doctor come and look at their baby (same symptoms) and he gave them some nasty medicine and antibiotics, but dad reported they really didn't seem to help all that much. When Rose wasn't sick she was really quite entertaining. I think I saw her first steps in the hotel room. If they weren't her first, then they were her second. She walked kind of like a sumo wrestler. One of her favorite things to do was walk up to the other babies in the group and bop them or take away their toys. 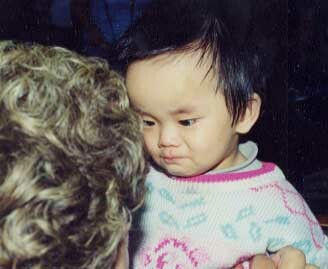 She was definitely the most aggressive baby in the group. In the evenings we hosted "bubbles and bottles" in the hall outside our room and the joke was guard you babies, here comes Rose. Heidi nicknamed her Fang. After observing her dogged determination I decided this child was not a Rose. Charlie suited her personality much better. I could just see my father, the original Charles in heaven laughing his kazaza off, he knew I was "fixin to pay for my raising" Having a strong willed child is not a bad thing, yes discipline has to be very creative and sometimes you think all you are doing is getting onto your daughter, but I know there is not a soul out there who will ever be able to take advantage of my daughter. She will not allow it! I don't think she will ever feel the need to cave in to peer pressure. As outgoing as she is, she will be the leader, her friends will give into her peer pressure. I just hope she doesn't decide to rollerskate down the high way at midnight or pierce her tongue! 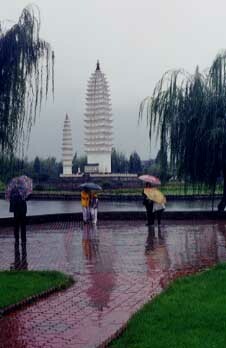 Kunming is really a neat city, although August is considered the rainy season and not the best time to visit. It rained on us every day. It kept the heat down, but even at 5000 feet it was still quite humid. 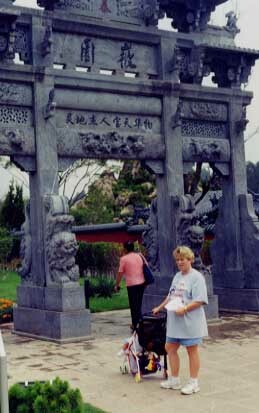 I remember thinking I would die in China in August, but I was very cool most of the time. I didn't take a sweater for Charlie or any warm clothes, but I quickly discovered a department store and bought her a sweater. I'd had my fill of the clothing police and given the throwing up and diarrhea she was having, I felt she probably did need to be warmer. We were taken on a couple of different tours. The first place we went was the Expo 99 garden. Oh my gosh, talk about beautiful! There were garden entries from all over the world. Mr. Gu and Raymond tried to keep us together initially, but we would have no part of that. We finally convinced them we were adults and quite capable of taking care of ourselves. It was decided we would meet back toward the front at a given time and we were turned loose. Linde and I mostly stayed with Heidi and Dieter. We stopped for a break and to give the babies bottles. Immediately we were the center of attention. Everyone wanted their picture made with the Westerner's. I'll bet I posed with different people for about 100 pictures. Finally a young man, who appeared to be about 18 or 19 asked to take a picture with me and when the person taking the picture was getting ready to snap it, I leaned over and kissed him on the cheek. This got a huge laugh from all the bystanders. Of course then they all wanted their pictures taken with us, but we were getting really tired of the game and they gave us our space. We mostly toured the Chinese gardens. 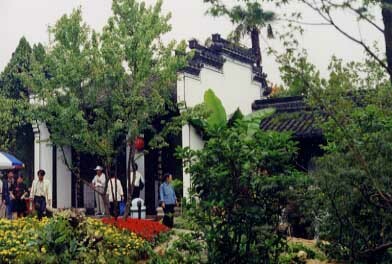 Each province was represented and I especially wanted to see the Anhui (Julie's province) garden. It was lovely, but then they all were. As we were heading back to the front to meet up with the rest of the group, I noticed an older lady walking kind of like her feet hurt. I glanced down at her feet and she was wearing these really funky little shoes. It suddenly dawned on me, she had bound feet. It is my understanding this practice went out during the cultural revolution, but she would have been in her 30's or 40's then. Again this is my understanding, but I think this is a process that is started at a very young age, so I guess she never "unbound" her's. It was really a sight to see. 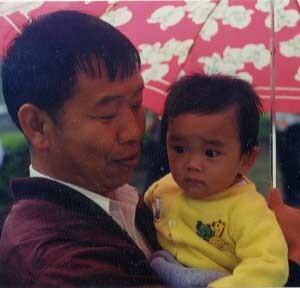 The other neat tour we took while in Kunming was visiting the Ethnic Minority Villages. Yunnan Province is home to many of China's ethnic minorities and just outside of Kunming is an amusement park (that's what they call it, no rides though) in which several of the minorities have little villages set up. They were very interesting and the grounds were beautiful. I loved the Bai native dress. (At the start of Charlie's story is a picture of her wearing one these people's native costumes) The houses were all fascinating and some of the customs were quite unique like the bitter tea ceremony in which three types of tea are served, each having a different meaning. It was here I learned that Yunnan province is the only province in China where elephants occured in the wild. As you can see from the pictures of the village it was again a misty/rainy day. 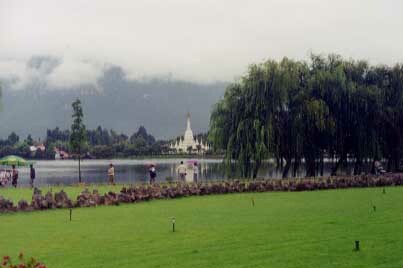 Looking at the temple across the lake was almost spiritual. 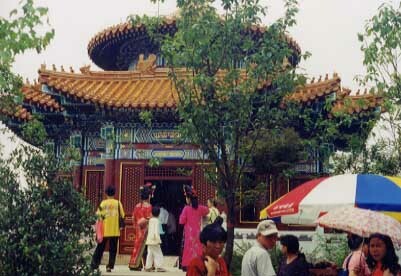 Kunming has got to be one of the most beautiful places in China. 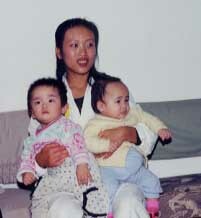 Several of the orphanage workers accompanied us to the Ethnic Minority Villages. One man asked if he could carry Charlie, hey no problem. I hadn't taken a snugglie type carrier, only a stroller (which you really couldn't use and keep your daughter dry.) Carrying a baby around really wore your arms out, even though Charlie only weighed about 16 pounds, she was still heavy. I found out Charlie was this man's favorite little girl in the orphanage. He told me, "this one very clever." Even Mr. Gu remarked "she has very bright eyes" The orphanage doctor (I think she was the doctor) had walked much of the park with my sister and she told Linde, that Charlie had been the man's favorite and he was reluctant (but at the same time happy) to see her go.